I am not proud of this fact, but I have fallen into gossip lately. It is one of those things that most of us fall into at one point or another. For me it usually involves orthodoxy, or rather, a lack there of. Father Barron, in his series Seven Deadly Sins Seven Lively Virtues, discusses gossip under the sin of envy. He talks about how we, as sinners, can become envious, or, even happy, at another person’s failure. This is absolutely true. Think about the last time you fell into gossip. Was it because you heard some bad or juicy news about someone else? I think that frustration can drive gossip, as well. I am a revert to the Faith. I spent my Twenties living in the somewhat Catholic category, before I fully entered cafeteria Catholic for a few years. During that time, I had a lot of my fellow Catholics ignoring my behavior because they themselves ignored Church teaching in various areas. Yes, relativism. How can I be brought to the fullness of Truth when the people around me are not living out Church teaching? That is how I felt. And in living as I was living, I hurt others too by my example, to my utter shame. When I finally found my way fully back to Christ’s Church, I realized just how much damage had done to me and to others. Loving someone is not leaving them in their sin. Loving someone is showing them God’s mercy and love and then showing them that in choosing to love, we must abandon our sin. Do we fail? Absolutely! But, we cannot say to someone either in the Church or who is contemplating coming into the Church, that it is ok to ignore certain aspects of Church teaching because the Pope needs to “get with the times”. Rather, we need to get with Jesus Christ. Church dogma and doctrine, is God’s dogma and doctrine, revealed through Revelation and the Holy Spirit. Because of my own dalliances in mortal sin, I am deeply passionate about protecting others from the same state. It truly kills the soul and cuts us off from God. Love shows us that we must help each other away from serious sin, as well as help each other with habitual sin. That being said, sometimes my own passion can get the better of me. It can start of as righteous anger in the face of ignorance or disobedience and turn to sinful anger. I think that I have reached that point. I realized it when my husband asked me if I had stayed late at the church last night “complaining” about what had happened this past weekend? Whoops! I have crossed into sin territory. He is absolutely right. I either need to take action or let it go, but stop harping on it. I think that I may let it go for now and trust that our Bishop is working things out slowly. There is a lot of clean up to do. I need to pray for him and our Diocese. 1. Say something positive about the person during the conversation. Speaking in a complimentary and charitable way, reminds us that there are good traits in everyone and that we too are in need of mercy. 2. Talk directly to the person you have an issue with, instead of about them. You may need advice from your spouse or a trusted friend beforehand, but always plan to confront the person, or forgive them, and move on. 3. Change the subject. Try to veer the conversation into a new direction. 4. Take action. If it is a situation that you need to deal with, then get the information to the person it needs to go to. Once it is handed off, then you need to move on and trust that it will be dealt with in an appropriate manner. 5. Pray for the person. When frustrated or angry at someone, be sure to pray for them. It can be an inner struggle, but try to focus for a few minutes and ask Our Lord to bless them. 6. Go to Confession. After gossiping, go to Confession. 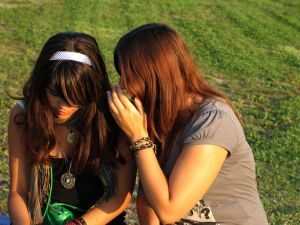 Gossip wounds us and it wounds others. Go and seek forgiveness and be wiped clean. It reminds us that we are all sinful and make mistakes, and it also sets us free from our anger and resentment. I hope that this helps you to avoid gossip. I know that it is something that I must work on now and in the future. God bless!